Schnauzers do require more grooming than say a Labrador but less than perhaps a Rough Collie or an Old English Sheep Dog. Show dogs in our breed are required to have the head & jacket (neck, side, and back) plucked or stripped. This method can be learned and with practice the owner could maintain the coat year round. Schnauzers do not shed in the doggy sense of the word. They do loose hair from time to time but in a way like you or I might loose hair. They do not seasonally shed great masses of it. If the coat is left too long between brushings you will get that fluffy undercoat hair coming out and leaving 'dust bunnies' on your floors. You will also find that a coat that is left to grow too long is more apt to loose hair. This is because the coat has 'blown' and needs to be stripped (or clippered). Since our dogs are shown we try to give their coats weekly attention and "rotate" their coats, this allows us to have dogs "in coat" year round. Schnauzers are usually stripped in a pattern method the first time. This requires that the hairs be pulled out completely from the jacket area and it requires 10 to 12 weeks for the dog to grow a new coat to show length. This whole procedure is not as horrible as it sounds as the hair that is pulled is usually in a "blown" state and comes out quite easily with little or no pain for the dog. (Our dogs fall asleep while we work on them). The hairs on the head are also plucked but ears, throat and bum are shaved usually with a #12 or #10 blade, while the beard, brows, and leggings are neatly trimmed with scissors. The owner of a Schnauzer who does not want to show may choose to have the coat clippered. This is usually done every 3 or 4 months to keep the coat in top shape. The one drawback to clippering is that after a number of clips the dog may loose that wonderful harsh salt and pepper coat and the undercoat will take over and give the dog a softer more silver, black or fawn appearance. One of the reasons we chose the Schnauzer for our breed is because we loved that wonderful harsh feel and the lovely shading. Our original intention was to just have a companion and with the help of our breeder we learned to groom our own dog. We usually do all the grooming from teeth to toes and all parts in between. Since Schnauzers are so people oriented they really love most of the grooming sessions with two exceptions, toes (schnauzers have very sensitive feet) and the chest and neck area when it comes to plucking hair. I would say that you should look to spending an hour every week or so grooming your dog. Schnauzers do not often get that Doggy odour some breeds get so they do not require an all over body bath very often. We do bath their beards, legs, chests, and bottoms when needed. Toenails also require weekly trimming to maintain their nice high "cat's paw" feet. Schnauzers require moderate exercise. Our dogs spend time out in the runs 4 or 5 times a day. In nice weather they love to go for walks or rambles in the woods. 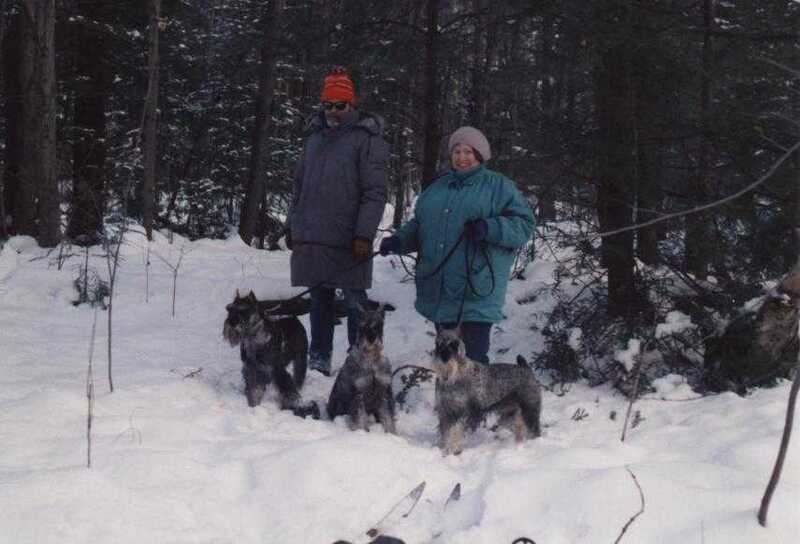 In the winter our dogs pull the dog sled, attend obedience class, and play 'hockey' on the pond with us. Some schnauzers attend agility and flyball sessions year round. Our dogs are quite fit but we also know schnauzers who do just fine with less activity. They adjust quite well to their owner's lifestyle and if that owner isn't quite active enough a schnauzer will find a way to remedy that.